I did so much post adjusting on this as far as saturation, sharpening, curves, levels, brightness, noise reduction, and some minor cloning objects out, that I'm wondering if I should have put it in Digital Art. Anyway, I know it's not that good, but considering it was handheld from a quarter mile away, it's not that bad. Well, I decided it needed something in that empty space at the top right, so I added a moon from a different shot I took. It was handheld also, and a whole lot farther than a quarter mile. Now I know for sure I should have posted in Digital Art.....Too late now.....Sorry! Very nice images. I noticed on the last image, you brightened some of the vegetation. It needed that. Nice job. Who ever owns that house, I'm sure they would love a print of it. Darrell, thanks for the comments. I have to be honest and tell you that I'm not very good with photoshop yet. I still don't have a grasp on how layers work. Even though I have managed to use layers in the past and finally get the effect I was wanting ( after much struggling ) I didn't use layers to add the moon in this pic. I just cut and pasted it in paint. 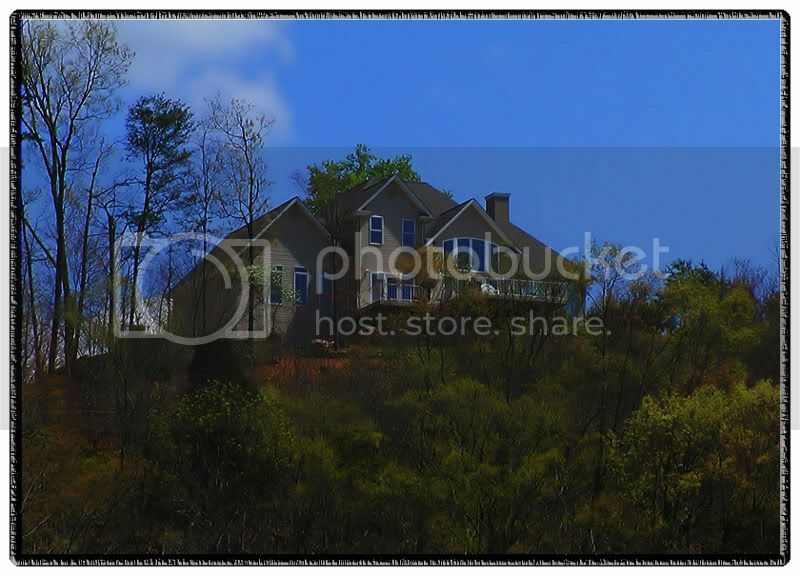 I then used photoshop to blend the sky color around it to match the sky color in the house pic. Then to get it to look right, I brightened the whole picture, and I agree with you. It needed it. Of course I didn't realize it needed it until I did it and saw how much better it looked compared to the other pic. Peter, I appreciate your comments as well. Those sure are some good creative ideas you have. Like I was telling Darrell though, I'm not that good with photoshop, so even though I'd like to try some of your suggestions, I would surely louse things up. You sure got me interested in looking for that autoFX package though. Jack, I think you did one heck of a good job. Sure, you mucked about with it digitally, but so what? You ended up with a well-composed, fun picture to look at. It's an odd thing about layers in Photoshop. It takes a while to visualize what's really going on with them. For me, the light bulb lit when I saw them in my mind as sheets of transparent film laid over the background. I tried this image on my husband because he's having fits with layers. It just didn't work for him. AutoFX's Mystical Lighting can be downloaded in demo mode. You can't use your own photos to test the plug-in. You're forced to use the pictures they've supplied, doubtless hand picked to work well. This ploy turned me off so badly that I decided to continue doing my lighting effects the long way around. Oh yeah, Darrell. I meant to mention, I'd be happy to make a print for the folks that own this house, but I don't know who owns it. It's not a simple matter of going and knocking on the door. That house is way up a very steep hill, and from my vantage point, there's nothing but lake and river between me and the house. So, since I don't have a boat, I would have to drive several miles in either direction to be able to cross the river, and once there, I would have no idea how I would get to that house. That's what has held me up as well, I would have prefered if they disabled save&print and let you try on your own images. Rather expensive for a plugin if they don't do what you want. Jack.... Great work. I bet the owner would love the photo, if you could get to his/her house.